Menopause itself is not associated with an increased risk of developing cancer. However, the rates of many cancers, including breast cancer, do increase with age. In addition, some of the drugs used to manage menopausal symptoms may increase or decrease a person’s cancer risk. Certain factors increase the risk of developing breast cancer. Some factors can be changed (such as lifestyle choices), but others cannot be changed. Having many risk factors does not mean a woman will develop breast cancer, and having no risk factors does not mean she will not develop the disease. 1. Age - Age is the single most important risk factor for breast cancer. The chances of developing the disease increase with age. About 70 percent of women diagnosed with breast cancer each year are over age 50, and almost half are age 65 and older. 2. Family - Personal risk is also greater if an immediate family member (mother, sister or daughter) has had breast cancer, particularly if it was at an early age (less than 50 years old). There is a genetic test for a mutation in the BRCA gene that screens family members who are at high risk for breast and ovarian cancer. Also, women who have had a breast biopsy (removal of breast tissue) that shows certain types of benign disease, such as atypical hyperplasia or lobular carcinoma in situ, are more likely to get breast cancer. 3. Breast cancer in one breast - Having cancer in one breast may lead to development in cancer in the other breast. 4. Late menopause - Entering menopause after the age of 55 can increase a woman's risk of developing breast cancer. 5. Early menstruation - Starting menstruation early in life, especially before the age of 10. 6. Childbearing age - Having a first child after age 30. Women should get annual mammograms starting at age 45 and be personalized. Some women can wait until age 50 to begin screening mammograms and have them done every 2 years. High risk women need more intensive screening. Examine your breasts each month after your period. If you notice any changes or lumps in your breasts, tell your doctor. Detection of breast cancer in its early stages -- hopefully before it moves outside the breast -- can significantly improve the chances that treatment will be successful. The survival rate from breast cancer increases when the disease is detected and treated early. The American Cancer Society recommends that women age 20 and older do a breast self-exam each month. By doing the exam regularly, a woman becomes familiar with the normal feel of her breasts and can more easily notice changes. Any change should be reported promptly to a doctor. Women ages 20 to 39 should have a doctor perform a breast exam every 3 years. The best time is a few days after your period. 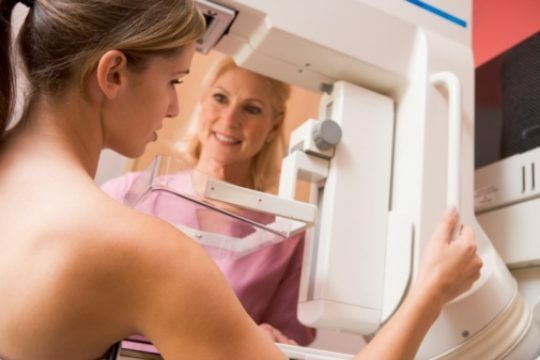 Mammography is an important method of early detection that uses low doses of X-rays to take a picture of breast tissue. The purpose of a mammogram is to find abnormalities that are too small to be seen or felt. In addition, ultrasound can help characterize other breast masses, such as cysts. However, mammograms will not detect all breast cancers, which is why physical breast exams are very important. To find out if you are at increased risk for breast cancer, consult your doctor. Your doctor can tell you your estimated 5-year and lifetime risks for breast cancer by using the Gail model. If you are an increased risk, other screening methods such as a breast MRI may be used in addition to a mammogram. Evidence suggests that the longer a woman is exposed to estrogen and progesterone (either made by the body or taken as a drug), the more likely she is to develop breast cancer. Hormone therapy (HT) is given to postmenopausal women or women who have had their ovaries surgically removed to replace the estrogen no longer produced by the ovaries. The longer a woman is on HT, the greater her chances may be of developing breast cancer; however, there is no evidence that death rates are higher in women who use long-term hormone therapy.